Almighty God has been generous enough to bestow all His grandeurs and natural beauty to Upper Siang. The cascading waterfalls, profound valleys and mejestic snow-capped mountains, boisterous streams, silent lakes and pristine forests are yet to be touched by the mortal hands. The natural surroundings, exotic and locale present a perfect destination for tourists. Upper Siang is inhabited by four main groups of tribes, viz. Adi, Memba, Khamba and Mishmis. Though they have distinctive socio-cultural life, they have co-existed with each other from the time immemorial. The Adis and Mishmis are animists who are believers of the Sun and the Moon, while the Membas and Khambas are Mahayana Buddhists. Hence, a diverse type of culture in terms of dances, festivals, dresses can be seen in this district. Besides, many holy places, caves, shrines are located, which are accessible through foot tracks. A few years back, His Holiness the Dalai Lama and His Holiness Penor Rinmpoche of Mysore had visited Tuting and laid the foundation stone of of a Gompa / Monastery. Adventure sports like trekking, water rafting, angling have immense scope for development in this area. For the last couple of years, International White Water Rafting Expedition is being conducted in Upper Siang on the mighty Siang river. In the presence of this beautiful landscape, diverse cultural background, large number of buddhist pilgrimages, Upper Siang deserves its rightful place as a tourist destination. The following 6 tourists circuits / destinations have been identified for religious, cultural, ecological and adventure tourism. 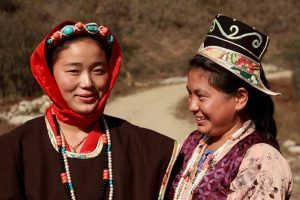 Mariyang is the homeland of Padam, Pasi and Millang communities located at 52 KMs from the district headquarters, Yingkiong. It is also accessible via Pasighat – Ranaghat road, crossing the river Siang by boat. It is situated at a hillock overlooking the confluence of the river Yammeng and Yamne. Apart from scenic beauty, one can go and see the Damro village, which is known to be the largest village of Upper Siang (10 Kms from Mariyang). Pekimodi, which is famous in Adi folklore is 34 Kms away from Mariyang. The Padams, Millangs and Pasis have a rich traditional culture. Solung a festival is celebrated in the month of September. During this festival, a traditional dance form namely Ponung is performed by the village belles. Where to stay? :- Inspection Bungalow (IB) at Mariyang. Best time for visit :- All round the year. Main tourist attraction :- Scenic beauty, trekking, angling, picnic spot, etc. Memba, a Nyingma Sect. of Mahayana Buddhist inhabits Gelling Cricle. Lossar, Torgya, Dhruba and Tsobum are the main festivals of Memba’s. The festivals are celebrated according to the Buddhist Calendar. During these festivals, BARDOH CHAAM popularly known as Mask Dance is performed at the Gonpas. Dancers wear the mask of animals. The prime theme of the dance is to depict victory of good over evil and also to show the importance and preservation of all living creatures. There is 3 hours trekking from Gelling to Bishing where a series of beautiful cataract falls down from mountain above 300 feet. The remnants of Kapangla Pass is still present near Gelling. Earlier, this pass was the main trade route for Adis and Tibet. Where to stay? :- Inspection Bungalow (IB) at Gelling. Best time for visit :- September to February. Ekodumbing (Riutala) is under Simong territory. During the month of October and November the people of Simong arrive here in group to collect EMO (Aconite), which is used for hunting. Many rare species of animals like Takins, Muskdeer (Sikung), birds like PEDE, TANE, SIKO (all local names) can be seen here, medicinal plants like NYODO (Coptis tita), TALAP (a type of wild garlic), etc. are found here. Now a days the place has acquired religious importance for the Buddhists. They call Eko Dumbing as Riutala and regard it as a paradise of AWALOKESHWARA, which means the paradise of CHENRISI, the Dalai Lama. It is three days foot march via Simong village and 6 days via Tuting – Tashigaon and Singha. The Buddhists Pilgrims from far flung areas arrive here in the month of August and September to offer their prayers.Riutala is a hill which is interspersed by many lakes. From this river Sipit, Yammeng, Simong Patang, Tangam Patang have originated. Around this place there are many caves which give shelter to pilgrims. The scenic beauty of Eko-Dumbing is breathtaking. How to reach? :- 3 days trekking Via Simong, 7 days trekking Via Tuting. Best time for visit:- August to November. Main tourist attraction:- Sipit Lake, Yammeng Lake, Komji Lipik (Caves), Simong & Tangam Patang caves. NAY DEWAKOTA : Nay means holy place / shrine. Dewakota means abode of God derived from Sanskrit. It is surrounded by Nyigong (Yangshang Chu) river and is located on a plateau. It is 40 KM (Approx.) from Tuting and accessible only by porter track. The natives believe that Guru Rimpoche has kept many sacred treasure / script (TER) at Dewakota, which are yet to be revealed and deciphered. There are many holy spots like SINDURA, Guru Durpuk and numerous caves which were said to have been used by Guru PADMA SABBAWA. The caves can accomodate more than 100 pilgrims at a time. They are opened only during winter season, during rest of the year, the caves remain submerged under Yangshang Chu river. It is believed that those who visit Dewakota for 3 times will attain heaven and also wipe off all past sins. 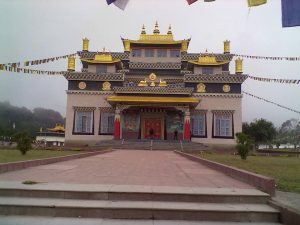 The Membas of Gelling and Khambas of Singha believe that the present pilgrim places like Dewakota, Riutala, Pema Shree, Dakar Tashi and Jachung were engraved by Lord Guru Rimpoche or Guru Padma Sabbawa – the Second Buddha. These holy spots were later discovered and unravelled by His Holiness TERTON NYANGGOE. Accomodation:- Local Caretaker / Lama of Dewakota provide rest house. How to reach? :- 2 days trekking from Tuting. One night halt at Nyukong enroute to Dewakota. What to see? :- Holy Shrines, caves, lakes, Gompa and Chorten. Tsitapuri is yet another pilgrimage centre under Yingkiong – Tuting Circuit of Singha Circle. Tsitapuri is believed to be the paradise of Lord Guru Rimpoche. A spectacular sight of this place is that there are more than 108 lakes in it. Lake Danakhosa is one of them, from where river Nyigong (Yangshang Chu) and Jeying Chu originate. Buddhist people believe that those who are fortunate or have pure heart witness different wild animals and a Gompa with a queue of Lamas with their prayer wheel and beads in their hands on the island. The lake is surrounded by barren mountain valleys covered with snow throughout the year. The scenic beauty is so breathtaking that people hardly want to go back. Accomodation:- Staging huts / Inspection Bungalows. Trekkers are advised to carry their own bedding and fooding. How to reach? :- 6 days by trekking (Tuting to Nyukong, Nyukong to Tashigaon, Tashigaon to Singha, Singha to Shibrang, Shibrang to Tsitapuri). Best season for visit:- June to August. Mouling National Park was established in 1982 with an objective to create a favourable habitat for plants and animals. It is located in the right bank of river Siang covering an area of 483 Sq. KM. This park is a reserved house for diverse flora and fauna. The vegetation of the area varies according to the altitude. Temperate alpine and coniferous forest at the upper reaches whereas the lower area is covered with tropical evergreen forest. 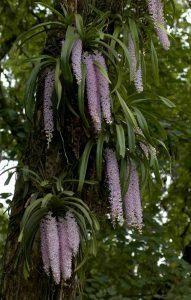 Ornamental plants like foxtail, orchids are abundant in this area. The park has also an impressive area of animals and birds. Many endangered species like takins, snowclouded leopard, golden languor, hornbill, monal scalater, serrow are spotted here. And many more species are there which are yet to be identified and recorded. One can venture into this park during winter season by seasonal trekking path from Bomdo and Ramsing villages. Inside the sanctuary, there are many attractive waterfalls. Dabung Waterfall and Nirbung Waterfall are two of them. This park is thoroughly a dreamland for trekkers and animal & bird lovers. Accomodation:- Jengging Circuit House, Forest Rest House at Ramsing. What to see? :- Rare birds, animals, orchids, waterfalls, etc. Best season for visit:- October to 1st week of January.